Hi I am attempting to migrate this video-vf-01 vFiler from one 3270 8.1RC2 cluster to another 3270 8.1RC2 cluster and I am encountering the error below. The destination has > 20Tb free - so space is not an issue. I get the same error if I choose a FC aggregate as the destination. Is there a testpoint to make this work? Error: Failed to select a resource. - There are no aggregates with enough space and reliability/label match for all the volumes in the vFiler unit. - Add more resources to the resource pool or select a different storage system. Do you have screen shots? You have the dfm plugin for RC2? Could be a new BURT but should work regardless of SATA or FC with 8.1 and Data Motion. The volumes shouldn't exist yet (data motion creates them)..for manual cli vfiler migrate you have to precreate the volumes but for data motion it creates them in the target system or aggregate you choose (sounds like you did all that though). A limitation of data motion is the same volume type... 32 to 32 bit and 64 to 64 bit. Even though 8.1 snapmirror supports a mix of 32/64, data motion does not. 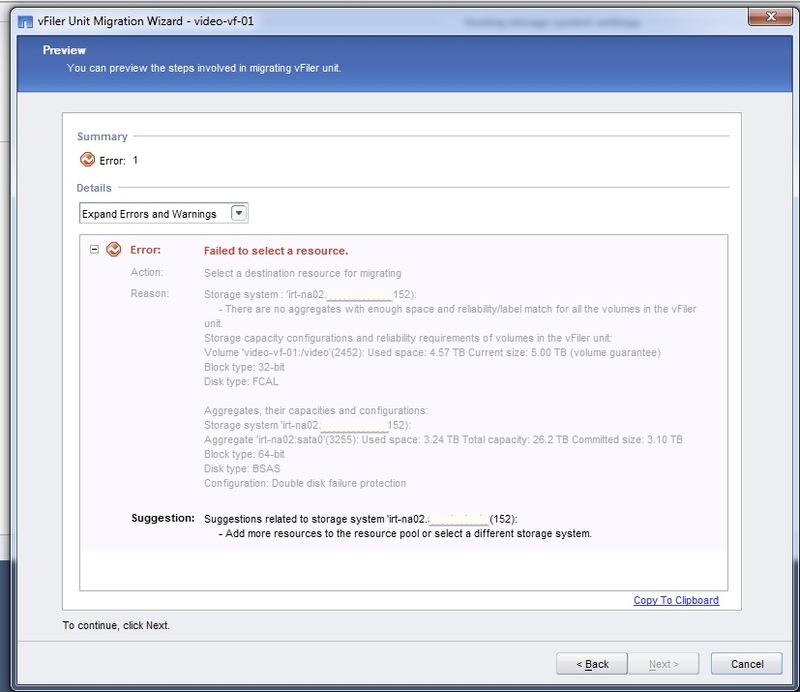 You would have to use vfiler migrate from the cli (without the guarantee of 120 second failover) to do this migration. There likely is a testpoint but without a official support, I don't see it as an available option 32 to 64. Still worth following up on the case though to see if the restriction can be worked around.